I love omelets. Really--give it to me florentine-style, or with mushrooms and hot peppers, or even (gasp) with some ham or bacon. Omelets are super adaptable to whatever ingredients are cluttering your vegetable drawer, and of course, super delicious. To lighten up an otherwise heavy omelete, I used two whole eggs and two egg whites. 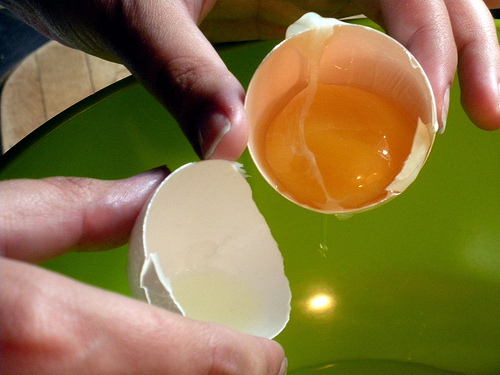 Separate an egg by holding it upright, carefully cracking the top, and tilting it so that the white runs into the bowl and the yolk is preserved. 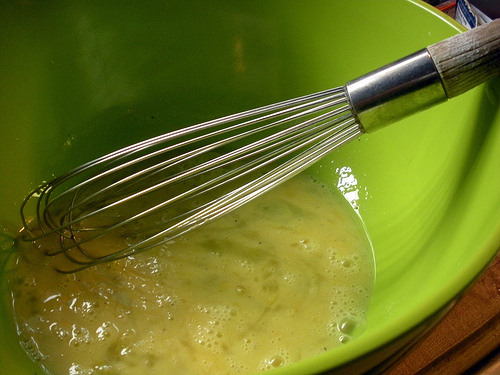 Whisk together your two egg whites, your two eggs, and a tablespoon of nonfat milk in a large bowl. Salt and pepper to taste, and add a splash of your favorite hot sauce (another moment in which I say: Cholula is practically ambrosia. Amazing). Set the bowl aside. 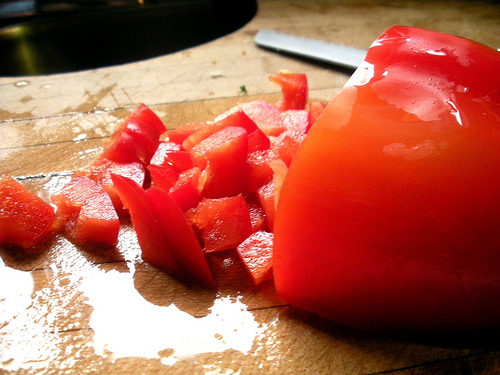 Chop up a medium red bell pepper and small sweet onion, and throw in a large pan on high heat. Add a glug of olive oil. Allow to saute for three or four minutes or until properly softened. Reduce pan to medium heat, and pour in the egg mixture. Allow to cook for another three or so minutes, then pop it under the broiler. Broil two minutes or so or until lightly browned. 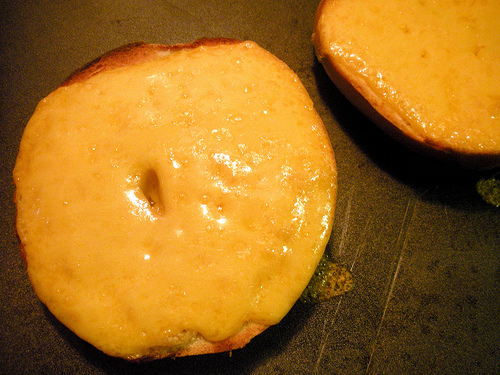 Sprinkle cheese on your sliced bagel, and broil until melted. Delicious. 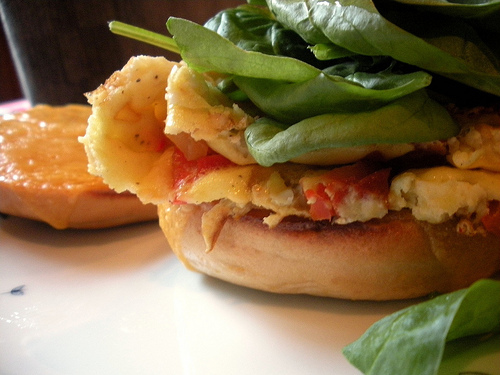 Cut the omelet in half, fold, and place on top of one of the bagel halves. Top with a handful of baby spinach leaves, and the remaining bagel half. Consume with gusto. 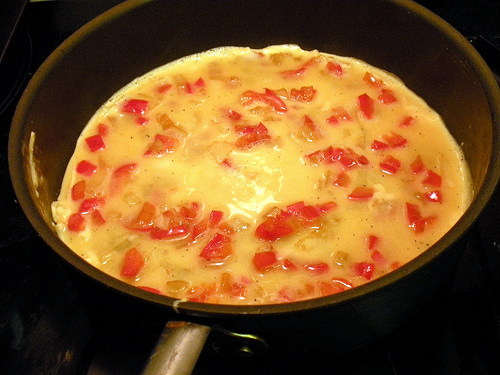 What are your favorite omelet fillings? Any tips for getting an ideal, fluffy consistency? Let us know in the comments! This is a really good substitute for a veggie burger. At first I thought there was meat in it. It looks that good! But I have to say, spinach and goat cheese is the best omelet ever. MMMMM I absolutely love omelets! I have them multiple times a week. I love onions, cheese, mushrooms, pico de gallo, and spinach in mine! How yummy! Coincidentally, I will be enjoying a Meatless Monday lunch, too. This sounds like a great breakfast sandwich. I never really consider making and omelet and then making a breakfast sandwich. 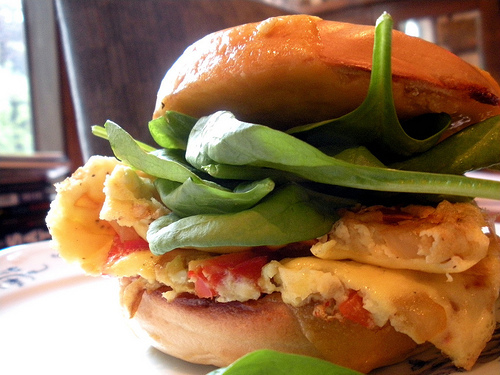 I always keep the ingredients separate for breakfast sandwiches but this is a great idea! Much less of a mess too! I love breakfast and work for Better Recipes so I always find myself looking for good <a href="http://breakfast.betterrecipes.com/" rel="nofollow">Breakfast Recipes</a>. I think this would also be great with a few jalapenos, yum! Love this recipe!! Love Meatless Mondays!! Love a pro egg post instead of the recent anti-egg articles. I love Mexican style eggs scrambled with onions, tomato, jalapeno, and cilantro. I eat it with avocado and tortillas. I love this pro egg post instead of the spate of anti egg articles we've been hit with lately. I love eggs Mexican style: scrambled with onion, tomato, jalapeno, and cilantro. I eat it with avocado and tortillas.